Steep Café Tea by Bigelow (formerly Novus Tea) represents a new chapter in a 70-year old quest to produce the perfect cup of full leaf tea! Bigelow's pursuit of perfection has taken them to the world's leading tea estates and inspired them to seek out and learn from cultures rich in tea tradition. Each of 15 gluten free varieties (including 10 organic) contain only natural tea leaves, herbs, flowers, fruits, and natural flavors. 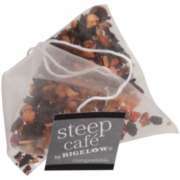 Steep Café's pyramid tea bags are compostable! The unique pyramid shape provides greater space for each leaf to expand, releasing its superior characteristics and unique flavor nuances in the manner of loose leaf tea.